There is strong evidence that Mexican police tortured some of the key suspects arrested in the disappearance of 43 students, according to a report released Sunday by an outside group of experts. The Inter-American Commission on Human Rights expert group says that a study of 17 of the approximately 110 suspects arrested in the case showed signs of beatings, including, in some cases, dozens of bruises, cuts and scrapes. One suspect said he was nearly asphyxiated with a plastic bag, and medical studies showed another had been slapped on the ears so hard his eardrums broke and his ears bled. The Mexican government recently released documents suggesting investigations had been opened against police and military personnel, but authorities have not answered requests about whether anyone has been arrested or charged. The 43 students at the radical teachers' college of Ayotzinapa have not been heard from since they were taken by local police in September 2014 in the city of Iguala, Guerrero state. Family members and supporters of the missing students chanted "They took them away alive, we want them back alive!" at the news conference where the report was presented. No high-ranking officials attended and the Mexican officials had no immediate response to the report, which called the government's investigation flawed and incomplete. "The Ayotzinapa case is a crossroads which Mexico will have to pass, by strengthening the rule of law," said Colombian lawyer Alejandro Valencia, one of the lawyers. The allegations of torture could endanger any chance of convictions in one of the highest-profile human rights cases in Mexican history, especially because the government's version of events — that corrupt police handed the students over to drug gang members who killed them and burned their bodies at a trash dump — hangs in large part on the testimony of some drug gunmen who now say they were tortured into confessing. "It is a lie the way they said they caught us," Patricio Reyes Landa said in testimony made public by the experts' report. "They went into the house, beating and kicking. They hauled me aboard a vehicle, they blindfolded me, tied my feet and hands, they began beating me again and gave me electric shocks, they put a rag over my nose and poured water on it. They gave me shocks on the inside of my mouth and my testicles. They put a bag over my face so I couldn't breathe. It went on for hours." 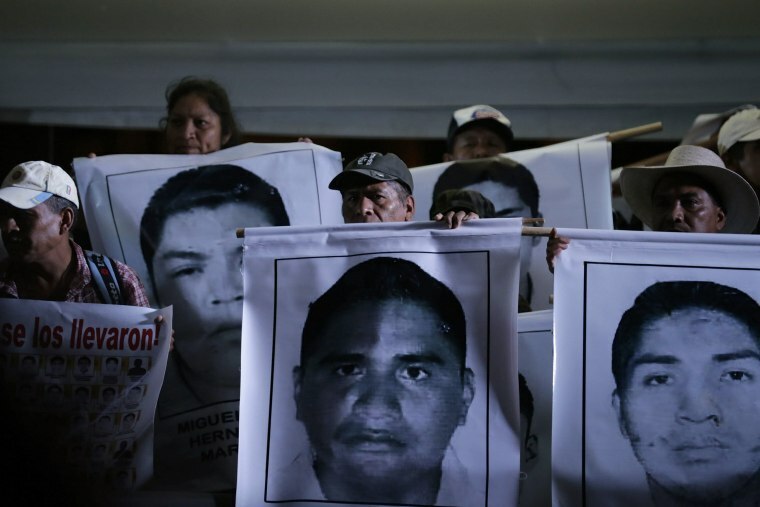 Amnesty International called the experts' report damning and Erika Guevara-Rosas, Amnesty's Americas director, wrote that "There seems to be no limit to the Mexican government's utter determination to sweep the Ayotzinapa tragedy under the carpet."